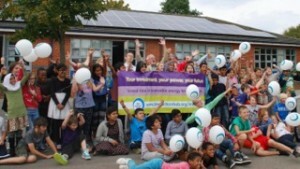 Hook Norton Low Carbon have loaned £80,000 to local social enterprise the Low Carbon Hub to support their solar schools project in northern Oxfordshire. The loan is helping the installation of solar PV on 12 schools in the area. 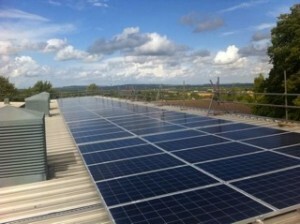 Two of these schools – Banbury and the Warriner – had over 200kW of solar PV installed over the summer and are now generating clean, green electricity in time for the new term. The Low Carbon Hub promotes local ownership of a decentralised renewables infrastructure through collective, community financing and helps deliver the City and County council’s ambitious local carbon reduction targets. With proactive partnerships like this at work, it seems that local organisations rather than central government are providing the leadership needed on climate change. The Low Carbon Hub has now launched its 2014 community share offer to raise £1.5 million investment into 1MW of solar PV installations on 18 schools – including those in north Oxfordshire – and a number of local businesses across the County. The sale of shares in local renewable energy projects will mean that these installations will be 100% community owned, putting local power in the hands of local people. The Hub share offer is open to investments from £250 to £100,000 until the 28th November. Investors will receive an average return of 5% or up to 8.2% for those eligible for tax relief via the Enterprise Investment Scheme (EIS). Investment in the Low Carbon Hub will bring renewable energy to Oxfordshire and create a greener, more sustainable future for us all. The Low Carbon Hub is an Oxford-based social enterprise and has been shortlisted for several awards in recognition of its work in championing community energy: Observer Ethical Awards; 2degrees Champions Awards; and the UK Community Energy Award. The Hub works in partnership with the Oxfordshire County Council and Oxfordshire City Council. The 2015 Hub Solar Schools Scheme is now open. For further information please contact the Low Carbon Hub.